When the first hint of Fall is in the air, I start daydreaming of soup.I love soup. I am a soup-a-holic. And not just ANY soup. In colder months, I crave the spicy, rich earthy soups that fill your house with warm flavors while they are simmering away. Take, for example, posole. 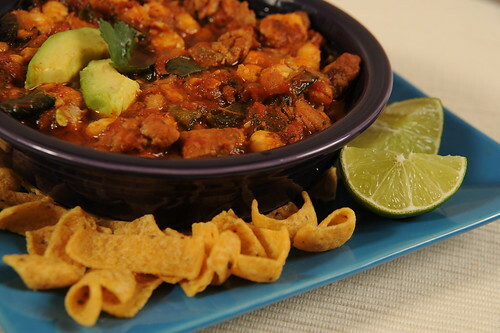 Posole is a spicy corn stew and an ancient Aztec food that originated in southern Mexico. And it has a somewhat unsavory origin. So. A-hem. Our version here is infinitely more enlightened than the original! 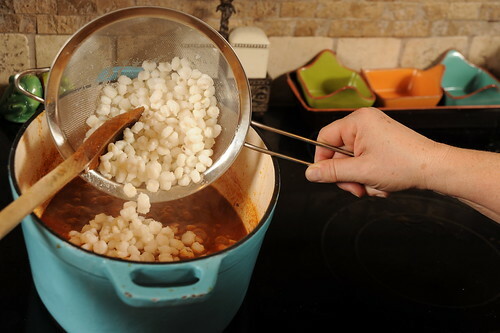 The native peoples considered corn to be a sacred plant and so posole was a popular and revered dish. I used poblano chiles in this, which are very mild. If you want heat, roast a few jalepenos, too! This is an incredibly easy version – from grocery bag to table in 45 minutes! I have made many varieties in my day, and I like using chicken thighs best in this recipe instead of the traditional pork. The dark chicken meat is full of flavor and stands up to the simmering required for this recipe. And, chicken thighs are one of the best bargains in the grocery store these days – they are usually less than 50 cents each. I used 3 thighs for this recipe, so the whole pot full of posole – which feeds at least four people – was less than $10. 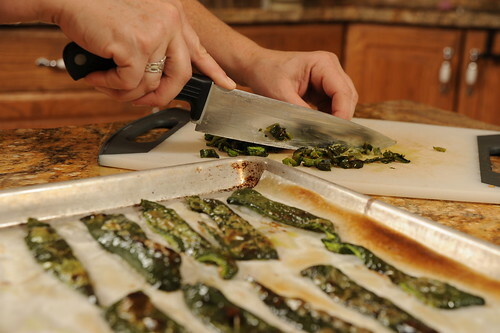 Cut poblano chiles into strips and place skin side up on a baking sheet. Lightly brush the chiles with a little canola oil. Broil chiles about 3 inches from heat for 2 or 3 minutes, watching closely so as not to burn, until chiles are browned. Remove from oven, let cool and dice. Heat 2 tablespoons of oil in a large stockpot. Mix together the flour and oregano, and then toss the chicken pieces in that mixture. Cook chicken pieces in two batches over medium high heat for 3 to 5 minutes, stirring frequently, until well browned. Remove chicken pieces from pot. Add remaining oil to pot and add onions, stirring constantly and cooking for about 2 minutes, until onion begins to be transparent. Add garlic and cook another minute. Add in all remaining ingredients. Simmer for about 30 minutes. 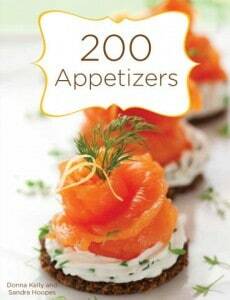 Serve hot garnished with cilantro, avocado, cheese or sour cream, as desired. You got me with ” from grocery bag to table in 45 minutes!” and under $10. I’m teaching a niece to cook and this recipe will score points for taste, ease and affordability. Seattle Dee – What fun! I love cooking with kids!